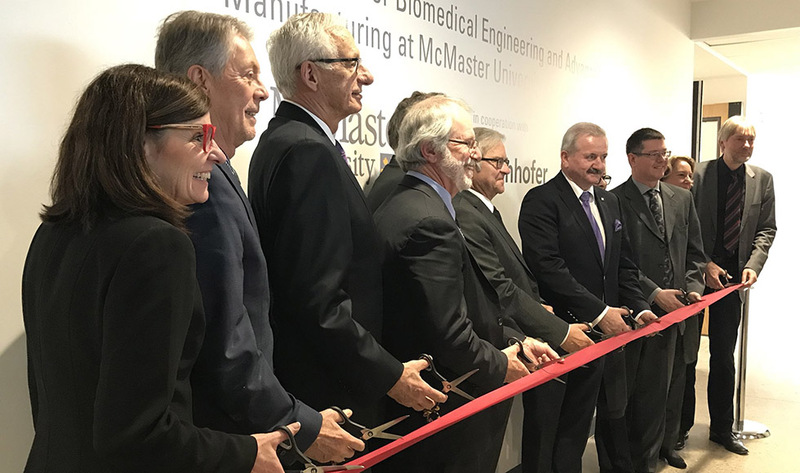 The new $33-million Fraunhofer-McMaster Project Centre for Biomedical Engineering and Advanced Manufacturing (BEAM) has opened its doors, bringing together the expertise of researchers from science, health sciences and engineering. Located at the McMaster Innovation Park, the 20,000-square-foot facility is the result of a joint partnership with the Fraunhofer Institute for Cell Therapy and Immunology (IZI), a world leader in manufacturing cell therapies, based in Leipzig, Germany. “McMaster is a worldwide leader in life sciences and bioengineering research and we are grateful for this partnership with Fraunhofer IZI, and all levels of government, which will help accelerate our discoveries into the marketplace, creating many health and economic benefits for future generations,” says University President Patrick Deane. Funded by all three levels of government – the federal government investing nearly $12-million, with the Government of Ontario and the City of Hamilton investing $4-million each, BEAM is also supported by McMaster, Fraunhofer IZI, and several industry partners. It will be home to a team of researchers, from both McMaster and Fraunhofer, who will work to develop and translate new technologies for cancer treatments; new biomarkers for cancer detection; point-of-care tests for rapid diagnosis of infectious and chronic disease; and new biomaterials to aid in treatment of disease. With some 35 current and future industry partners, one of the centre’s main tasks is to take existing technologies and prepare them for the marketplace. It will help to commercialize new products, accelerate growth of small businesses and attract new talent to the region. When fully operational, BEAM is expected to create nearly 75 jobs.